We're glad you're here on our site and learning more about our district and schools. We're excited about what our district has to offer and hope you will be as well. Our teachers and staff work to improve academic achievement, and all of us here at Clinch County are dedicated to providing the best educational opportunities for your child. In the links below, you'll find out more detailed information about our district and what sets us apart. You'll also get a close-up look at our governing board and our district administration. 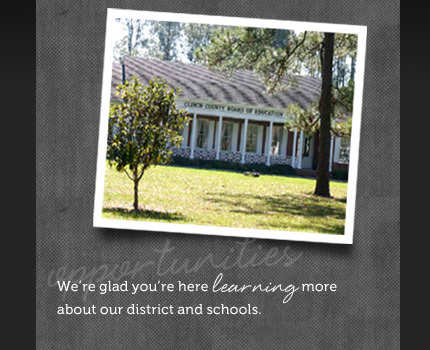 We hope you enjoy learning more about Clinch County School District.